When I got into blogging almost 5 years ago I was new to both the word and the world. I just wanted to write honestly about parenthood, and to keep a baby book in the way that I knew how. Throughout the years, I have followed different blogs on and off, my interest waning as content either stayed static or shifted in focus too dramatically. my one special site. I have written many times about my love of Ramshackle Glam both on here and over on 511. Her site is top on my browser, her book is on top of my coffee table. I have been reading Ramshackle Glam since day 1 of the site. And I have never stopped. and supporting each others’ posts on Facebook and on Forums. I have followed Jordan’s recipes and used her holiday gift guide to buy my husband Transformers cuff links several holidays ago. I have watched her grow as a writer and a wife and a mother and it has been awesome. Truly. But, you know how things go. You meet your favorite actor or author in person and he or she is vain or mean or a drunk. You pull back the curtain expecting to see a great and powerful Wizard, only to find a small, meek man pretending to be something that he was not. But when Jordan arrived on my doorstep yesterday, after we had made plans to have her family come to visit us in Philadelphia for the day, I knew that this woman whom I’ve come to admire, and in many ways, know, would not just live up to my expectations, but she would blow them out of the water. We had the most wonderful day yesterday, as Jordan, Kendrick, Indy and sweet baby Goldie (literally the most well behaved baby EVER) came to our home and into our real lives. First off, they are really nice. They are kind and appreciative and smart and thoughtful. They are cool. Not in a showy or pretentious way, but in the sense that they can tell great stories and are interesting and fun. But, probably most impressive of all, they are good. They are just good people. And phenomenal parents. I got the chance to see some incredible parenting in action, as they make sure to treat their son like a real human being, while both meeting his needs and also their own. It was pretty amazing. So after years of online correspondence, I got to sit across my dining room table from Jordan, and we couldn’t get our stories out fast enough, jumping from topic to topic like excited new (and old) friends. Within 15 minutes we were sharing an incredible chocolate, cream filled donut from the Amish bakery. She was going into my refrigerator for orange juice and I was teasing her for putting it back with just a drop left in the bottle. Within an hour we were sitting on the leopard print rug on my bedroom floor, as she allowed me to confide in her about things that I can’t always share, with no judgement, just understanding. Kendrick and my husband hit it off just as well. They bonded over talks of comic books and business and we all talked and laughed as we went from fireside in my living room, to the Please Touch Museum, to a dive bar with craft beer and real Philly cheesesteaks. But the true stars of the day were our kids. My almost five year old daughter and their newly 3 year old son had an epic love affair. So much so that he decided to ride with us in our car everywhere we went; so much so that he asked to come live with us; so much so that they spent dinner kissing and canoodling. It may have been the cutest thing ever. while also being exactly the real and normal person who she portrays her self as on her site. She doesn’t claim to know or do or have it all. But she is beautiful and elegant and extremely, extremely kind. And I am so grateful that they came, driving 3 hours each way, to spend their Sunday with us. And since the moment we left we have been texting pictures of our kids kissing (each one cuter than the last) and jokes, not like online penpals who live states or worlds apart, but like friends. 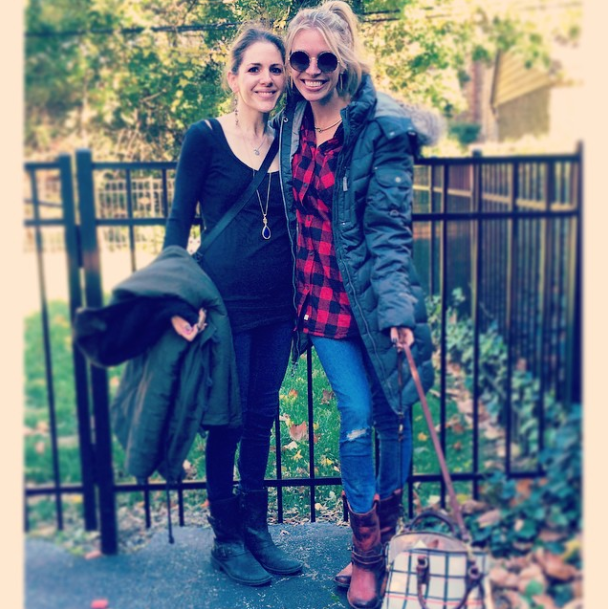 Her book may be entitled “Ramshackle Glam: The New Mom’s Haphazard Guide to (Almost) Having it All” and I can say that one of the things she now has is a friend in her corner. A confidant. And a fan. Not of a persona, but of her person. I read with interest this most recent blog and began to think about the notion of meeting those who write anonymously or, more accurately, those individuals I know as correspondents rather than as people. Relationships are forged in a variety of ways. Although the level of detail and distance varies, the means by which we interact is crucial to the definition and boundaries of an acquaintance. A correspondence-relationship has parameters and boundaries. These boundaries determine the degree of intimacy in a relationship. They help us to understand the limits and the nature of the interactions. They allow for both a degree of and a degree of safety and confidence that the relationship can be contained. In considering the writing which I do and the relationships forged with words, there is a degree of fulfillment which I feel, but also a degree of comfortable distance. On one hand, therefore, I was heartened to read about your encounter with Jordan. It seemed as if your relationship was able to make the leap from âpaperâ to person. But did you wonder about the inherent risks you were taking by re-defining the relationship? What would have occurred had the person writing for all of these years was someone who you did not like? How would that impact on the support and wisdom you would glean, and have already taken to heart over the years, by way of the âRamshackle Glamâ? As we all know, changing the parameters of a relationship can be exciting and beneficial. It can also be dangerous and disappointing. I am curious about how you made the decision to establish personal contact? Did you consider the risks? And, perhaps more relevant, how would you handle a request from an unknown reader who asked to meet you? It is perhaps the fact that you had confidence, based on your correspondence with Jordan, that the personal meeting would be worthwhile and good for you both. But, as a rabbi, I worry about the dark side of people, the part which they can hide. I am glad that things worked out for you and your fellow blogger. How would you have handled the situation if Jordan had initiated the meeting? These are just some questions which came to my mind and was curious if you had considered similar questions. These are really interesting questions, and to me, the answer is that if our meeting had resulted in a less-than-wonderful experience (if we hadn’t gotten along, or even if we simply had gotten along less well) I suspect I would have chalked it up to a day trip and a playdate for our kids and continued reading Becca’s blog online, albeit with a slightly new perspective – I don’t think it would have taken away from the lessons I learned from her site, because I had already taken them in, turned them over and over in my mind, and made them a part of me. It’s sort of like meeting a high school teacher many years later and discovering that you don’t really like him; does that take away from the lessons he taught you when you were in school? Maybe it reframes them slightly, but they’re still part of you. I moved to a new town a couple of years ago, and initially found it very difficult to meet people that I not just “got along” with, but felt were true friends – I have found them, but it’s taken time. And for a long time that felt like a real absence in my life, so for me (I keep saying “for me” because I think the decision to meet someone in person who you only know online is SUCH an individual decision, and not always the right one to make) I suppose it felt worth the inherent risks – which I felt confident were emotional risks rather than physical ones, given that we had already known all those “risky” things about each others lives (addresses, details about our children, et cetera) for many years. In short, the reason I wanted to meet IRL, as it were, was this: In my opinion, one of the most remarkable things about a person – the one thing that I consistently respond in an overwhelmingly positive way to whenever I encounter it – is honesty to the point of vulnerability, and that was something that I felt certain I would find in real-world Becca the same way I found it in online Becca. I think that these are both interesting perspectives. First, to address the safety issue, no, I would not go and meet a random and anonymous “fan”, especially not in my home. I am far too paranoid for that and though I like to lead with a trusting heart, I am also realistic about the world in which we live. I had no fears of safety when it came to Jordan however. we had real life mutual friends (for instance, her husband sang in the singing group at Yale with one of my best friends) so I knew that I had no reason to fear for my safety. I’m sure that Jordan encounters this more than I do, as she has a certain notoriety across the country, and I think it is smart to be prudent but when you decide to write a blog, you have to be open to the fact that you are letting people into your life. I have been “recognized” around the area many times by people whom I have never met, but are readers, and it is definitely an experience. They know so much about my life, yet I don’t even know their names. I think that the more profound issue raised was the idea that Jordan and I just might not have hit it off. That is exactly why I entitled the post “behind the curtain” because I think it is my default to expect that people you admire or like from a distance are not often what they seem with a closer lens. I wrote what I did about Jordan because this was such a refreshing example of a person who was exactly the woman she portrayed herself to be. I can’t say how I would have reacted had the meeting gone poorly. I think I would have been grateful for the education and education that she had provided me for five years and I would likely have put up more of a wall instead of trying to continue pursuing an ongoing friendship.